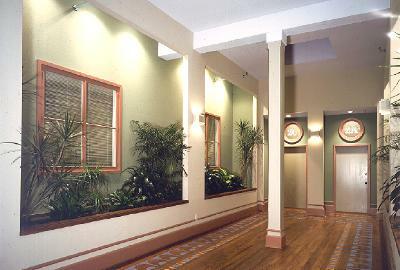 The design for the adaptive re-use of several Victorian warehouses in the historic district of Galveston, whose facades were painted by the muralist Richard Haas, maximizes ground level usage for retail and establishes a light-filled residential lobby on the floor above unifying the original separate structures. Each office/living unit is spatially defined by bathroom and kitchen cores with lofts above. Hand-stenciled polychrome floor patterns enrich the visual experience evoking the historic Victorian tradition.